What Makes Winter Wear So Comfortable and Soft? What are the images that come to your mind when you hear the word ‘winter’? I don’t know about you, but for me, its warm clothes, socks, that favorite scarf, boots, a warm and cozy blanket, a fat novel and a cup of hot chocolate. Don’t you just love the feeling of winter being around the corner? It’s the time to cozy up besides the bonfire and re read that favorite book yours. Winter seems incomplete without the soft, silky and warm winter wear. What makes winter wear so comfortable and soft? I have an answer for you. It’s the magic of core spun yarn and textile raw material like Inviya. To insulate our body from the cold outside, we put on sweaters and coats. By putting on layer upon layer of warm clothes we can effectively battle the cold weather. The most effective layer should be the base layer. In addition to being warm and cozy, the base layer should be effectively able to allow the sweat to evaporate. This prevents the body to catch cold and many other diseases. Earlier winter wear was made with very limited types of textile raw materials, but it’s different nowadays. In today’s world of textile and winter wear, a variety of raw materials are used. 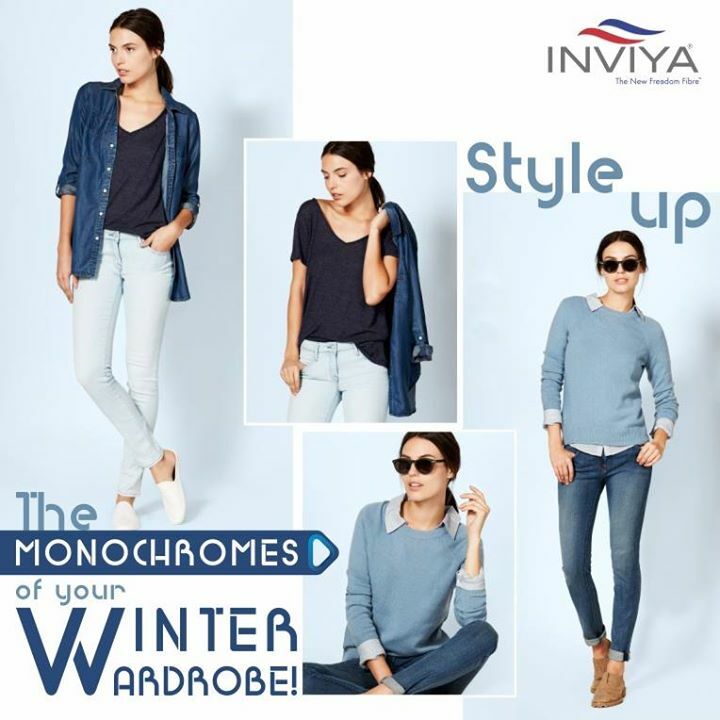 The textile raw materials range from Inviya core spun yarn to stretchable fibre like Inviya. These textile fibres and raw materials not only make the textile soft, it also makes the textile warm and comfortable. Two of the most essential things we need in our winter wear. With so many options of raw materials out there, the producers of winter wear textiles out there are able to produce a wide range of variety of winter wear. I personally feel that out of all the options in winter wear out there, sweatshirts are the best. I love the comfort that comes with them, along with the warmth. Another advantage that comes with sweatshirts is, you can easily remove them whenever you are feeling too hot. Unlike what most people think that ‘winter wear can be worn in a very limited number of styles, winter wear can actually be worn in a wide variety of ways. The styles can be divided 4 different types: Elegant & Simple, Uptown Girl, Accessory Addicted, and Neutral with a splash of color. Style 1: Elegant & Simple: Achieving this look is very easy! Pair a gray jacket with skinny jeans and some classy black boots; it gives a very sophisticated look to the wearer. By adding simple accessories like a dark colored scarf, and patent leather bag, you can pull off this look with ease. Style 2: Uptown Girl: Rich material textile and a glamorous look, this is what this look is about. If you appreciate perfect cuts, curves and luxe material, you will love this look. Trench coats, denim, and a scarf of a color that pops out, this look can be awesome for those days when you want to look glamorous and classy. Style 3: Accessory Addicted: people who love to accessorize should go for this look. In this look, the main part is played by the accessories. Keep the clothing neutral, and all the accessories will stand out. Try to keep the color of the accessories bold and something that stands out. Blue boots, a bright colored bag will really accentuate this look. Style 4: Neutral with a splash of color: This look comprises of subtle colored apparel, like a grey over coat, black boots, white cap and a pair of gray gloves. To add a little bit of spark to the whole outfit, put on that bright pink colored scarf to make the whole look stand out. So enjoy this winter season, with style, comfort and warmth, and look your on Christmas and New Year’s Eve!